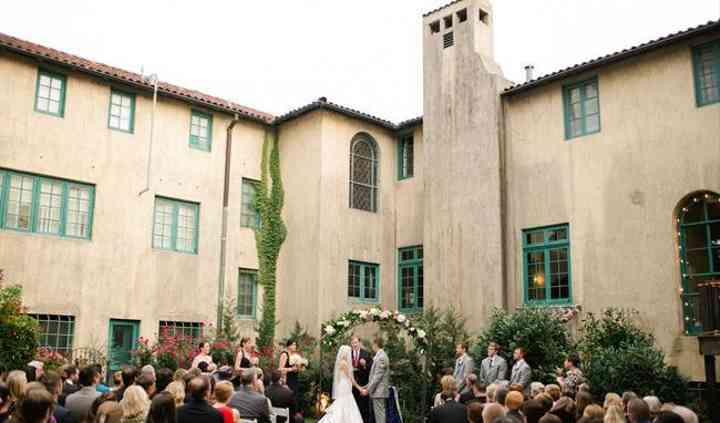 Situated alongside the Arkansas River in the heart of the Midwest, Tulsa, Oklahoma is a wedding destination beloved by locals and visitors alike. Whether you've just gotten engaged and are considering your location options or are in the throes of wedding planning, read on to find out everything you need to know about finding wedding venues in Tulsa. You've already decided on tying the knot in T-Town, but now the question remains, which wedding venue is right for you and your partner? There are a variety of places where to get hitched in Tulsa, including grand ballrooms, hotels and banquet halls that will accommodate everyone on your guest list. Peruse mansions, ranches and local landmarks, such as zoos, aquariums and museums throughout the city as wedding venue options. No matter which destination is right for your big day, you need to take into account your wedding budget. You and your partner need to mutually agree on how much you're willing to put toward your venue. On average, weddings in Oklahoma cost around $17,000. Depending on what kind of decorations you want, if you're providing food and beverages for your wedding guests or if you'd like live music, this number can be scaled up or down to suit your needs. The Tulsa International Airport is your best bet for getting into the city. Recommend that guests choose Tulsa International, or suggest Richard L. Jones Jr. Airport as a backup option. If you and your partner live in town, you know that most locals get around via car. Suggest your wedding guests reserve rental vehicles as they're considering their transportation options. Hotels in Tulsa are abundant and are priced around $100 a night. There are tons of accommodations to choose from, so why not simplify your guests travels by booking a hotel block? This lets them know you've already vetted the establishment and have reserved numerous rooms for those who are interested. Friends and family looking to stay outside the city can check out Broken Arrow, Sand Springs or Oklahoma City. Tulsa is known for being humid throughout the year. Pack some extra hairspray and pick the season that most appeals to you and your fiancé(e). Summer, and even early autumn, are known for unpredictable rain and thunderstorms. Plan accordingly if you think your wedding day will be exposed to the elements. Winters in Tulsa are fairly mild, but can get below freezing during the evening. Spring is the least popular time to get married in Tulsa, as from March to May is when weather is at its least stable in the city - hail, heavy storms and even tornadoes occur during this time of year. No matter when you choose to get hitched in Tulsa, all that matters is you're getting married to the right person. Celebrate finding the one that you want here on WeddingWire, with the help of our easy-to-use planning tools.